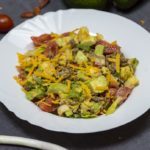 If you are craving a delicious, creamy and spicy Mexican dish, you should definitely try my keto taco salad. 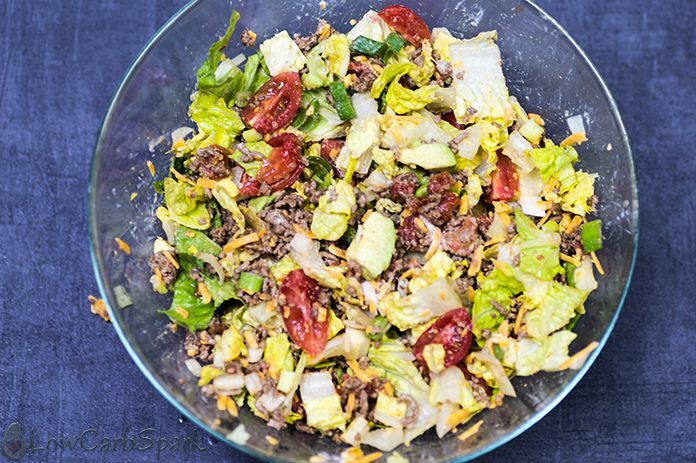 This taco salad is one of those recipes that seems complicated until you start making it. Even if you have a busy day, you can still find time to cook your own nourishing meals. If the food is also insanely delicious, there’s a win-win situation. Watch the step by step video below to see exactly how I make this delicious keto taco salad that ready in less than 20 minutes. 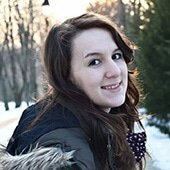 I will show you how to make a taco salad using simple to find ingredients, which you might already have in your kitchen. The difference between my version of the taco salad and the one you get from a store or on the restaurant is that mine is the gluten-free, low carb and suitable for a ketogenic diet. It is also customizable, and the serving size is enormous. For only 4g net carbs and almost 400 calories, you get to enjoy a huge salad bowl that will keep you full and satisfied for an extended period of time. The most “complicated” part is browning the meat, but that takes less than 10 minutes. I like to season the meat when it is almost cooked. 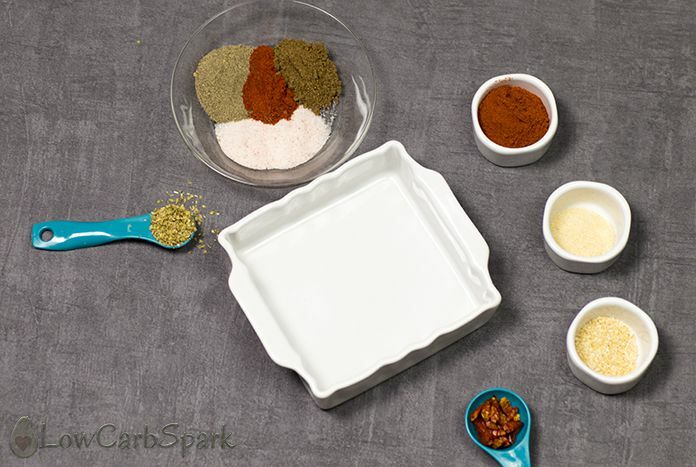 Being a huge fan of knowing exactly what I am putting in my body, I am also making the taco seasoning at home. The store bought mixes often have added sugars, starches, and other unhealthy ingredients that I want to avoid. It is super easy to make, and in the end, you will save some money and watch the quality of the ingredients while excluding all the unhealthy components. You can start chopping the vegetables while the meat is cooking and get the salad ready faster. There’s no need to make a separate salad dressing because the salsa and sour cream perfectly coat all the ingredients making the salad creamy and delicious. The main benefit of cooking your own meals at home is the power to adjust the quantity of the ingredients to taste. It is also easier to calculate the macros in a specific meal if you know exactly what are the ingredients inside it. The low carb taco salad is also great for meal prep. Cook the beef in advance, chop the vegetables and prepare the dressing. Store in individual containers in the refrigerator. 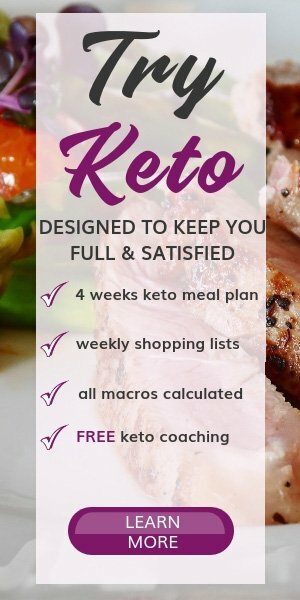 You can easily combine all the ingredients during the week and add any keto toppings you like. The keto salad would be great served with some cheese chips that are also super easy to make and low in carbs. If you want to save some calories, you can use greek yogurt instead of the sour cream and ground turkey instead of the ground beef. You can also reduce the quantity of cheddar cheese without sacrificing the taste. Follow the same steps and enjoy a low carb taco salad with fewer calories, because even on a high-fat diet calories matter if your end goal is weight loss. I used romaine lettuce, but you can use any leaves you love like baby spinach, kale, iceberg lettuce, or the same quantity of a salad mix. Toppings on this healthy taco salad may be customized to your taste buds. You can remove ingredients that you don’t like and replace them with other low carb vegetables: cucumber, red pepper, olives. Salsa and sour cream are a great dressing for our salad. You can choose between various salsa types that come with different hotness levels. Use a mild salsa if you want to balance the spicy flavor that comes from the meat. Make the taco salad healthier by adding some freshly chopped cilantro on top. There are plenty of options, it’s just a matter of personal taste. What toppings are you using in the taco salad? A super easy yet delicious and healthy taco salad recipe that you will instantly love. 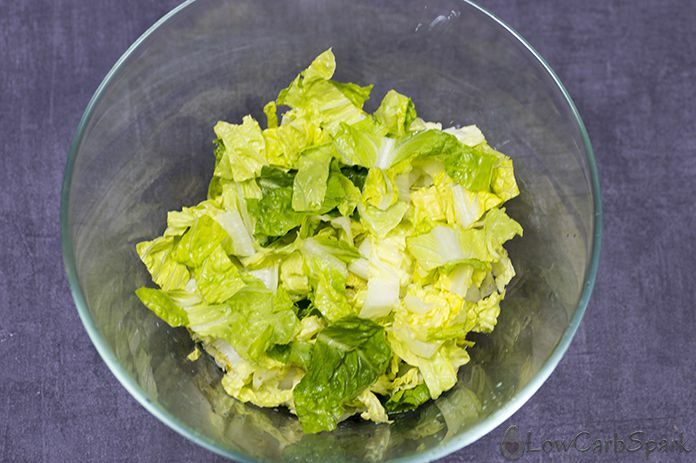 This salad is ready to eat in only 20 minutes and has only 4g net carbs per serving. It's a great alternative to a high carb meal when craving Mexican food. 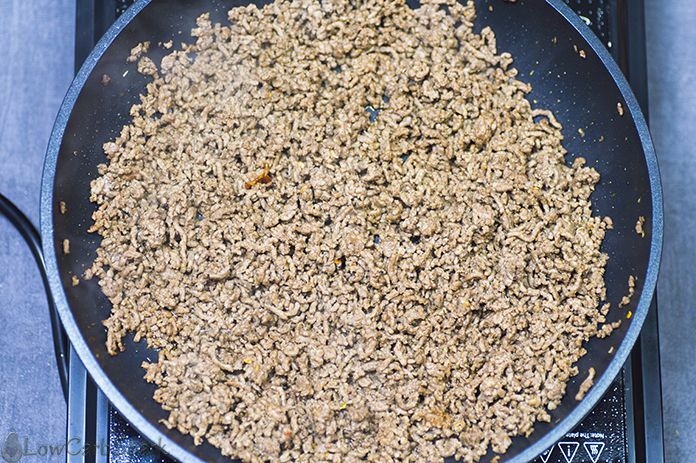 Perfectly roasted and seasoned ground beef flavors meet the freshness of all the vegetables. Heat a skillet over medium-high heat and add one tbsp olive oil. Add the ground beef and let it brown for 8-10 minutes. Season with one tablespoon homemade taco seasoning. Once the meat is evenly browned, remove from the heat and drain all the excess fat. 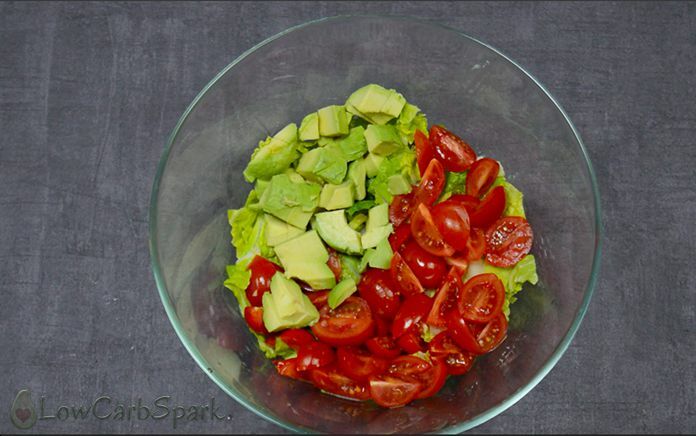 In a big bowl add the chopped romaine lettuce, grape tomatoes, avocado, green onions and the shredded cheddar cheese. Top with the sour cream and salsa. Add the cooked beef and toss all the ingredients to coat.